The City of San Diego stretches across a series of canyons and lagoons. While one of the largest counties in the country, the central area holds many discoveries if you like to get outside in nature. Originally the Missions were positioned to have access to fresh water and, soon after the bays and swamps were dredged bringing commerce and people. 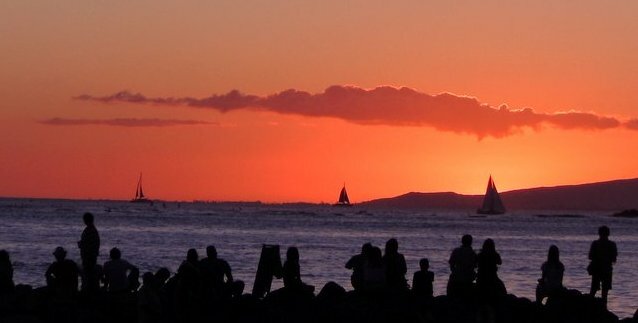 For all the industry, what visitors and locals have historically marveled at most are the natural highs – sunsets and ocean views year round, especially when seen from a lofty vantage. Here’s a small list of the more popular. You’ll need a car to reach these when you’re looking for what to see in San Diego. 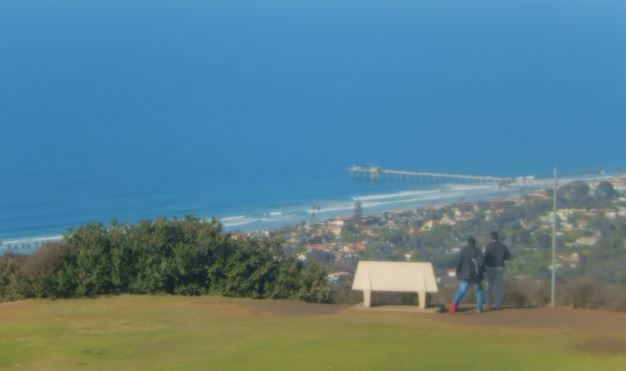 Photo credit: “Pacific Coast at La Jolla, CA, from Mount Soledad DSCN0203” by Billy Hathorn – Own work. Licensed under CC BY-SA 3.0 via Wikimedia Commons. Just north of Mission Bay and immediately west of the I-5 highway is a tall hill with a cross at its pinnacle. The road up curves past multimillion dollar neighborhoods that stop short of the apex. A 360-degree view waits at the top with benches and the Veterans Memorial, with its disputed cross. Easy hike from the top lot. Find out more. The Reserve with over 2,000 acres of land were set aside over a hundred years ago and walking the trails through chaparral, past elegant Torrey pine trees, its easy to imagine what the early settlers or California’s first native residents, the Kumeyaay people, experienced here. This is one of the most popular hiking areas in the region, so expect some company. You can park along the strand or pay lot then begin the journey up the trail directly. The other option is to start out on the beach, tracing the beach bluffs to a staircase and trail to the top. Watch for hang gliders flitting along the cliffs to the south. Easy to moderate hike depending on how much of the bluff trail you do. More here. This trail is a bit tucked away from park routes and the trailhead is just north and left of the Sunny Jim Cave store. The small parking lot adjacent was once featured in a scene from the John Huston movie, Chinatown. 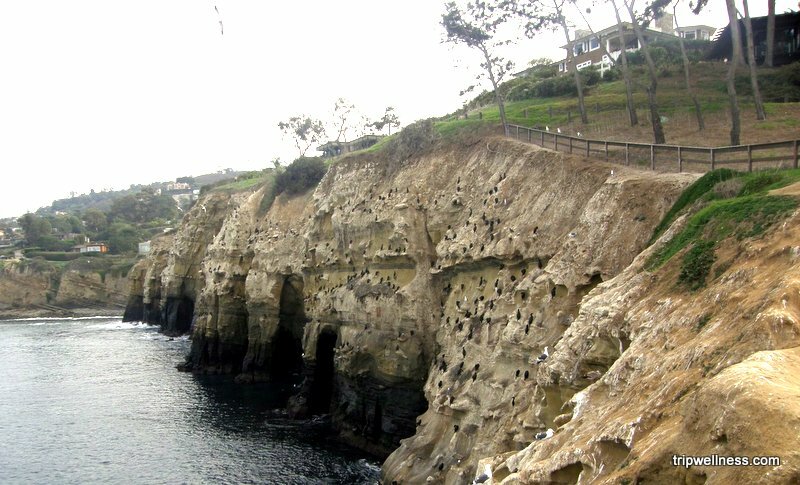 The trail leads you along cliffs and past mansions but you’re here for the stunning views across the bay to the north with the La Jolla Shores beach and the Scripp’s Institute Pier. A short, easy hike unless you trek to the beach. More info here. East of town this 3 mile, switchback trail is just east of Mission Valley. It’s rated moderate but be sure to take water and a hat if you tackle it on a sunny day. There’s no shade along the route. Dogs must be kept on a leash. The summit offers 360 degree views and on clear days you can see across the border into Mexico. More here. 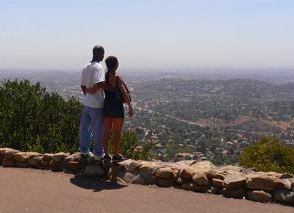 Josh Masters at Cowles Peak. Mount Helix rises further east from Cowles Mountain, its flanks ringed by homes. Not many visitors realize there’s a public park, run by a the private Mt. Helix Foundation, at the summit. The 1,370 foot peak hosts an outdoor Amphitheater and a 35 foot cross. There’s limited parking at the top but additional space near Mt. Helix Drive and Vivera. Visitors are welcome from sunrise to sunset. An easy hike from the top. More information. Remains of the original Mission Trails dam. East of town with over 54 miles of trails, the park hosts a creek and dam that are hedged in by tall hills. The hill trails earn a hardy hiker unique views of the region. The area was originally used by the Kumeyaay, and the Old Mission Dam, was built to store water for the Mission San Diego de Alcala. Moderate to challenging trail. More here. Not far from central San Diego you can skirt the bay and pass the military installations at Liberty Station (now a cultural center that’s worth a half day’s visit on it’s own. Museums, galleries, shops and restaurants.) Head uphill, pass the vast Rosecrans Military Cemetery and you’ll cross a military gate to enter the Cabrillo Park area. The views are stunning across to downtown, over Coronado Island and into Mexico. More here. This award-winning bridge quickly became an area landmark after its opening in 1969. 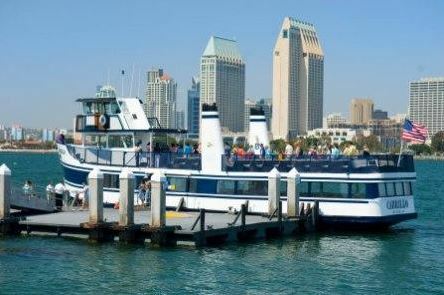 The distinctive curving sweep was the first structural conquest of San Diego Bay, joining the Island of Coronado and City of San Diego. Its vertical clearance of over 200 feet allows the tallest ships to pass beneath. Unfortunately you can only enjoy the view momentarily from a car but it’s breathtaking. More here. When you’re looking for what to see in San Diego, be sure to enjoy the view! 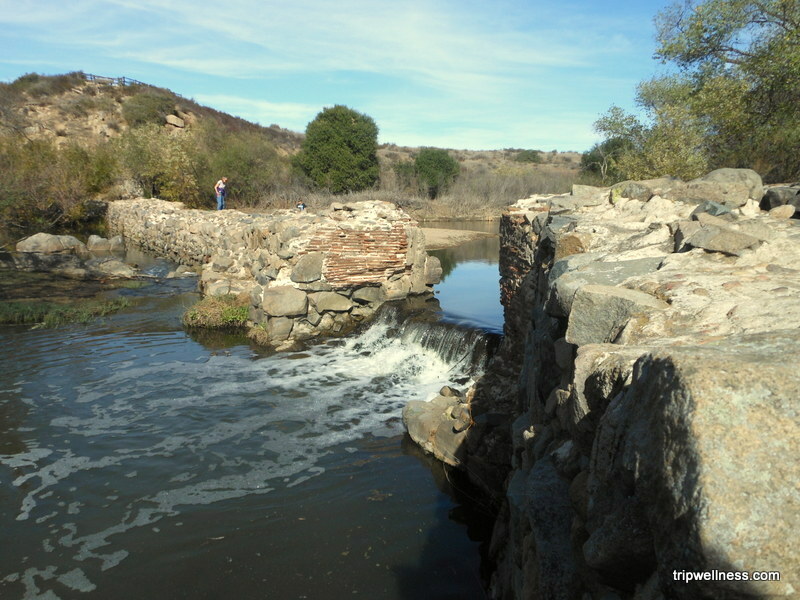 There’s a great hike alongside a stream in the Penasquitos Canyon Preserve, too! It starts at the Rancho Adobe house (historic) where there’s a parking lot and goes a few miles to a beautiful seasonal waterfall. Actually if you’re ambitious, you can follow the trail all the way to the beach! I’ve been on that trail and before the drought cut the water flow at the falls. Never walked all the way to the beach but that sounds lovely. So glad you enjoyed the posts. I share your fondness for the Cabrillo tidepools too. Love climbing the rocks and the rare power of the ocean there. 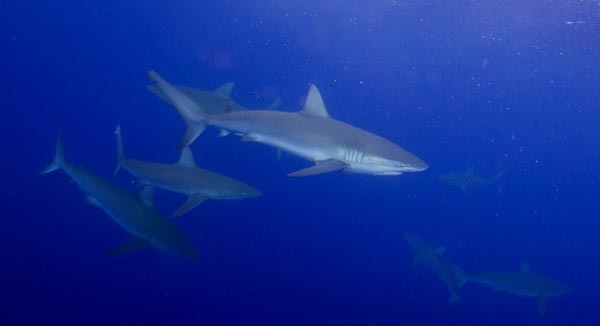 More often I glimpse it from a dive boat offshore! Love exploring the kelp beds when I get the chance and the water’s not too cold. No need for research when visiting San Diego! Really useful and it summarizes very well the main attractions. Thanks for sharing. Thanks, Adina, can’t say I’ve covered everything to do in San Diego but this is a start. Always lots going on. Let me know when you come by to visit! I can show you some other hikes as well. You’re just listing all the places I want to visit near San Diego! Especially Torrey Pines and La Jolla. 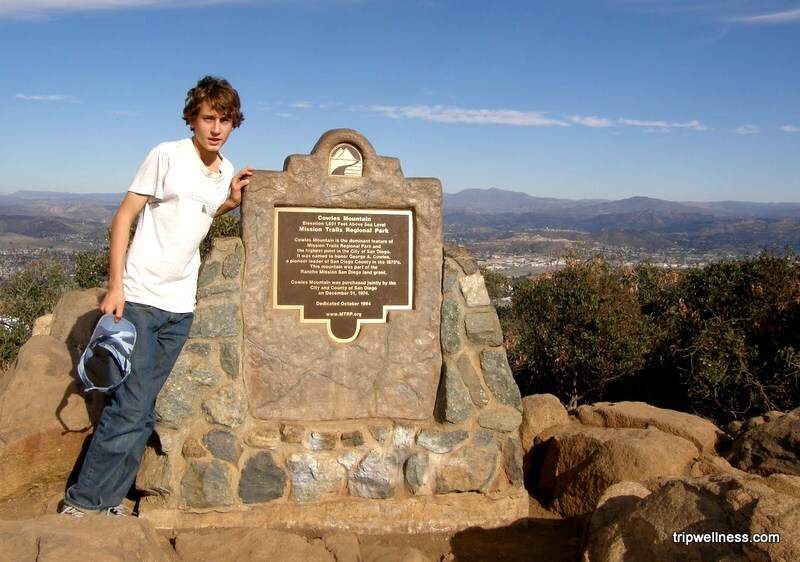 Bailey, I hope you can visit and explore these great spots plus so much more here in the San Diego area. Great suggestions! I’ve been to Mt. Helix and Cabrillo is already on my list for next time I visit San Diego, but these other ones are nice to know about. Carole, I’m impressed! I’ve driven by and around Mt. Helix many times but have never made it all the way to the top. Kudos and I hope you can explore Cabrillo on a clear, sunny day when the views extend to the horizon. This is a great semi-urban hiking adventure (with San Diego city proper so close). I’m headed to SD in June, so very much looking forward to a variety of things to do, including some of the above along with brewery tours and the beach! Great that you’ll be headed to San Diego soon. Hopefully this year we won’t have the May Gray or June Gloom that can blanket the coast most days. You’ll have fun no matter what the weather’s like. 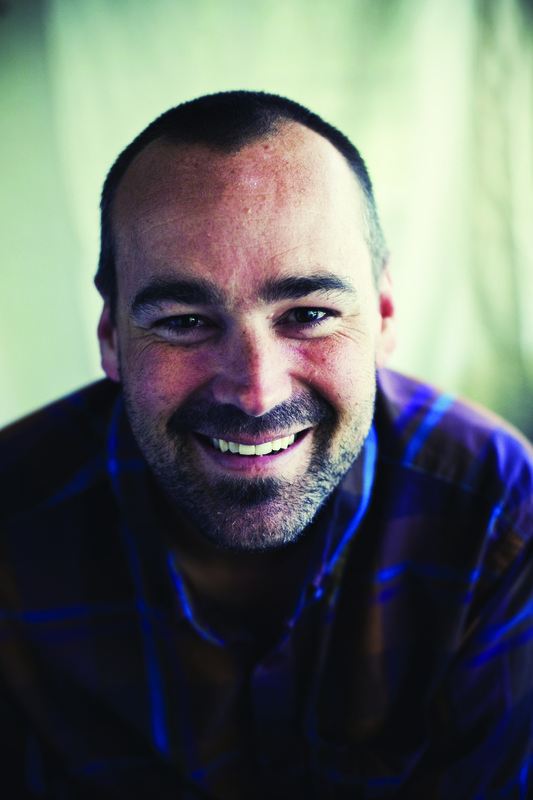 Sounds like you have the trip wired and I hope you can tackle some trails while you’re here. Just beautiful. I’ve never been to San Diego, but I’ve heard only wonderful things. Looks like you found some stunning stops there. Thanks, Mags, I hope you can make it to San Diego on one of your journeys soon. What a great itinerary for visiting San Diego! Thanks, Irene, I hope you get a chance to visit soon. Such a great guide for newcomers and San Diegans alike! Beautiful vistas. Thanks, Betsy, I hope these suggestions encourage visitors, and locals, to get out and explore more of San Diego. We love to hike – and these all look SO inviting! On my list for our next San Diego trip – thanks! There’s quite a variety depending on the weather and your hiking skills. I hope you can visit soon. Great timing for our upcoming San Diego trip. Wonderful to know you’ll be visiting soon.